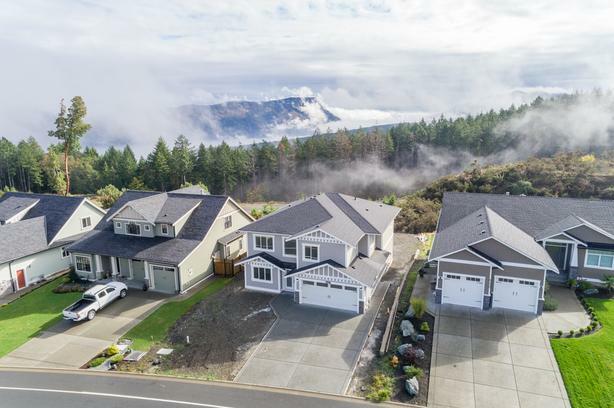 New Home in the "The Cliffs over Maple Bay". This area is one of the Cowichan Valleys finest neighbourhoods. Nearby parks, trails, hiking, tennis courts, marina, oceanside restaurants, endless recreation, elementary school and town. This gorgeous 6 bedroom, 4 bathroom home features laminate flooring, premium tiling/carpeting, open concept floor plan, white maple cabinetry, quartz countertops, sleek bathrooms w/backlit mirrors, crown moulding, heat pump, gas fireplace, hot water on demand, double garage and more. Three large bedrooms upstairs including the master with full ensuite bathroom and walk-in closet. Downstairs offers a bright bedroom/office, laundry room, two more bedrooms, backyard access w/covered deck and a family room with plumbing for wet bar/kitchen. Ideal spot for a 1 or 2 bedroom in-law suite. New Home Warranty, 9' ceilings, crawl space for storage, water line to fridge, gas for stove/bbq, ample parking, flat backyard, views and more. Listed for sale by The Ray Little Real Estate Team!